Publisher: Trubner & Co., 1866. First edition. Condition: Hardcover, cloth. Very good. Some small folds to pages. No other defects. 83pp., app 9″ by 6″. Extremely scarce. A detailed commentary on the state of affairs in Mysore (now part of Karnataka, India) during the period of British direct rule (1831-1881), which was preceded by the four Anglo-Mysore wars led by the Haider Ali and Tipu Sultan . In this book, British army officer Major Evans Bell discusses whether or not the rule of Mysore should be returned to the Wodeya (Wadiyar) dynasty, or whether the British should continue ruling it directly. 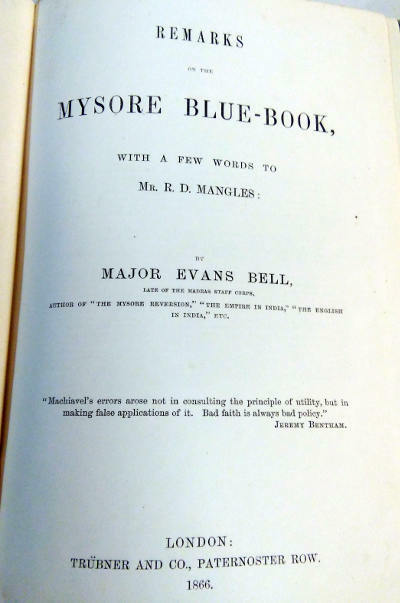 This book is a revision of Evans Bell’s Mysore Reversion on the same topic, updated in light of events in 1865-66, the two most notable ones being the puppet Rajah’s adoption of a son, and Henry Rawlinson’s Papers Relating to Mysore. Besides discussing the events of the day and the opinions of the general public and of persons involved, the book also cites Mysore’s conflicts with the Nizam of Hyderabad and of the Mahrattas, which took place in the late 18th century. 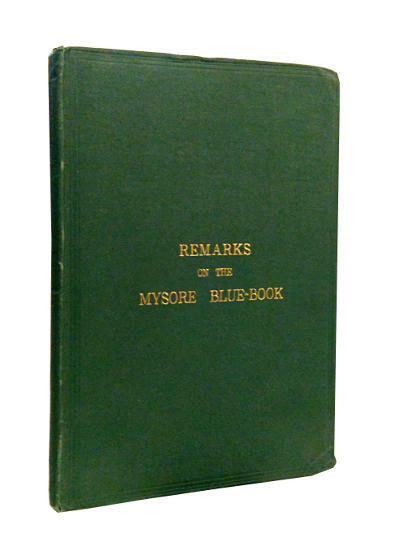 The title, Remarks on the Mysore Blue-Book, refers to the statistical and governmental papers published by the British government on its colonies.